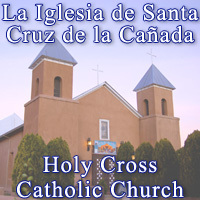 Belonging to the Diocese of Santa Fe, La Iglesia de Santa Cruz de la Canada (Holy Cross Catholic Church), and Holy Cross School work together to give your child the best Catholic Christian education possible. We give each student numerous opportunities to grow in faith and knowledge through prayer, mass, and the study of scripture. All of God's children must grow to understand that the Gospel must be a part of their daily lives. Served by Sons of the Holy Family Priests and Dominican Sisters, please learn more about La Iglesia de Santa Cruz de la Canada, its leadership, and its programs. MISSION: Guided by the Holy Spirit and the word made flesh, and centered in the Eucharist, fount of holiness, we, the community of Santa Cruz De La Canada, build families rooted in the values of the Holy Family of Nazareth to bear fruit for the Kingdom of God. Monday through Friday from 9:00 a.m.-12:00 p.m. and 2:00-4:00 p.m.
Other times by appointment only. The office is closed on Saturday and Sunday.